Visiting the Faroe Islands of Denmark last year was like stepping right into a fantasy tale — every where I looked, there would be something that will draw my breath in awe, as I constantly question myself if I was still on planet Earth… Without a doubt, the landscapes there were extremely majestic, and one of the islands’ true wonders would be the village of Gasadalur which is home to one of the most surreal waterfalls that exists in this world: Mulafossur. An 18-minute drive away from Vagar Airport, Gasadalur village is located in the west of Vagar Island and it is a natural beauty that is tucked between lush green fields and soaring rocky mountains. TRIVIA: This used to be one of the most isolated villages in the Faroes. After all, before 2004, villagers had to do a strenuous hike over 400 to 700-meter mountains every time that they want to get in and out of Gasadalur. (The other ways to access the village were by boat or by helicopter). Because of this limited accessibility, its population fell dramatically: in 2002, there were only 16 people that lived there! By 2012, the total population increased to only 18 people and several of the houses in Gasadalur actually stand empty today too. That being said, building the tunnel in 2004 — which was blasted through one of the mountains, thereby allowing car travel and easily connecting this remote location to the rest of the island by road — the villagers hope that this will continually help increase their numbers. Gasadalur also offers a great panoramic view over the island of Mykines which is well-known for the thousands of Atlantic puffins that breed and live in it. Hence, you should also plan to visit Mykines during your stay in the Faroes! By Car: The best way to go around the Faroe Islands is by car after all. That being said, it’s best that you arrange a rental online before your arrival on the islands. Rest assured, you can rent a car on-the-spot when you land at the airport since there are stalls there by Sixt, AVIS, HERTZ, and Unicar. Once you start driving around the Faroe Islands, be mindful of the driving conditions and rules (you can find all the details in here). By Bus: The main inter-town bus that they have is called Bygdaleiðir (they’re easy to spot since they’re big and in the color of dark blue). To get to Gasadalur, take the bus route 300 from either Tórshavn (main city) or at the airport. To see the complete timetable of the buses, go here. It helps to note, however, that public transportation is expensive in the Faroe Islands, so it’s best to buy a travel (multiple-ride) card beforehand with Strandfaraskip Landsins (the mother company of Bygdaleiðir) at the airport or at the main bus terminal in Torshavn. This travel card already covers busses and ferries around the islands (except to Mykines Island) and can cost 500 DKK ($70~ / Php 3,500~) for 4-days or 700 DKK ($100 / Php 4,900~) for 7 days. 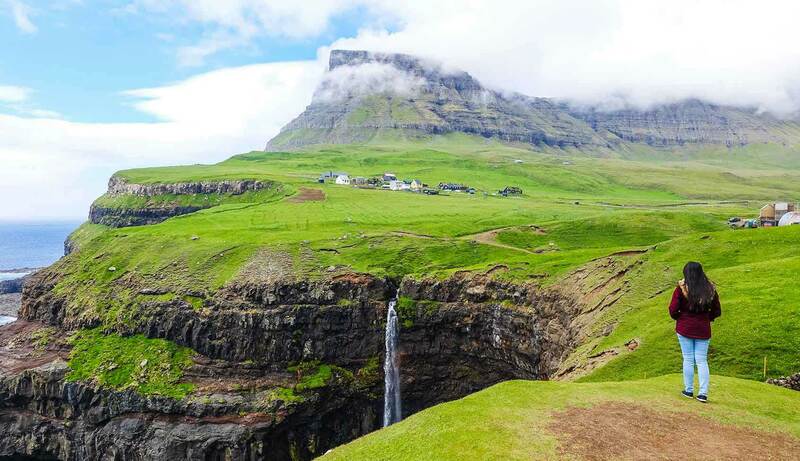 So once you arrive at Gasadalur, the view of its towering mountains would already welcome you — but in order to get a better view, especially of the Mulafossur waterfall that rests on its cliff, you should stop at a small gate to your left by the road, 50 meters away before the village. This gate will be closed, but you’re free to go over it since it’s mainly placed there to keep the sheep from crossing over. Just walk down this stone path and it will lead you to a perfect vantage point or viewing spot (that even has a bench — so take your own sweet time admiring the view here!). After your time in this place, make sure to drop by the village, walk around its small streets and witness the unique design of the houses. You will find that there are even some ruins there from the Middle Ages called as Uppi vid Gard and Gaesutoftir. TIP: It’s best to view Gasadalur the moment that you arrive at the airport (unless you plan to see it on your last day). I say this because first, it’s 57 km far from the main city of Tórshavn (where most accommodations will be) and second, it is also a bit far from most of the tops spots that you should be seeing in the islands. But before you leave the whole of Vagar island and make your way to Tórshavn, the other things that you must see along the way too that’s near the airport are Sørvágsvatn Lake and Fossá waterfall. Hiking is another great way to see Gasadalur. To do so, you will have to go through the old village path that the villagers used to take before the car tunnel was built. Difficulty: Moderate to difficult since it is steep and difficult to climb Gasadalsbrekkan (a high hill along the route), and the descent to Gasadalur is also steep. Surface: Grass path, but down towards Gasadalur, the pat is filled with stones and small rocks. IMPORTANT: You must be extra careful when going down Gasadalur since there are loose stones. With that in mind, this hike is not suitable for very young children. The path begins about 1km south (or left) of the tunnel entrance and the route starts in the valley about 3km west of the village of Bour. The 1st stretch of the path will run close to the edge of the mountain. Halfway along the route, you will find a plaque on a stone that reads Liksteinurin or ‘Corpse Stone’. You see, people in Gasadalur had to be burried in Bour, so coffins had to be carried over the mountain to Bour. The trip was very difficult and the only place that the coffin carriers can rest was at this spot. Further on, you will come to the spring Vigda. There is a story that a baby in Gasadalur became seriously ill and had to be taken to a doctor in Bour. On the way, the baby’s condition worsened and was about to die; but according to Lutheran faith, your soul doesn’t gain salvation if you die unbaptised, so a priest who was traveling with them quickly blessed this spring and baptised the baby. As you continue, you will see Risasporio, said to be caused by a ‘footprint’ of a giant in Gasadalur as per legend. And then somewhere, the path will twist down the mountainside to the village — this view will be one of the most beautiful sights of this hike! One of the harsh high mountains that surround Gasadalur is Arnafjall which is the tallest mountain in Vagar at 722 meters. 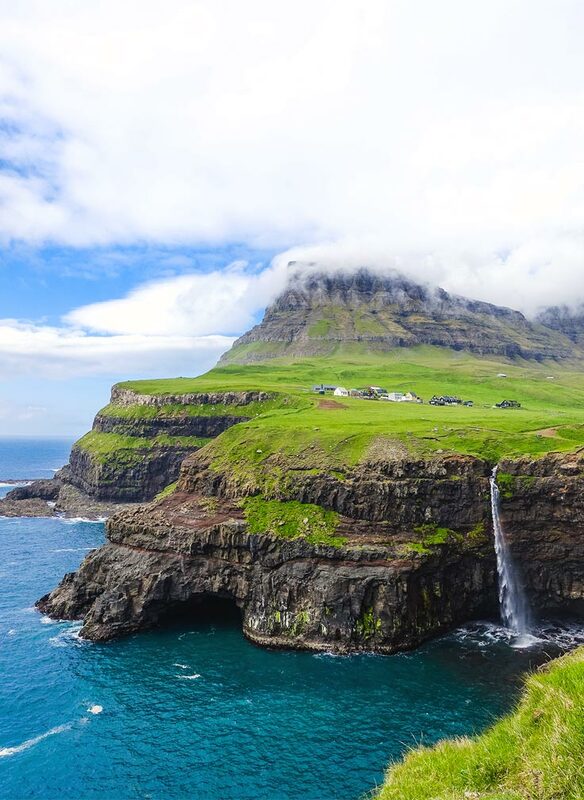 Where to get the best flight deals to Faroe Islands? Atlantic Airways is the only airline with a scheduled service to the Faroes and it usually comes from Copenhagen, Billund, Aalborg, Bergen and Reykjavik. Flighs can’t be booked through travel websites so you’ll have to book directly on Atlantic Airways website here. **UPDATE: As of March 2017, Scandinavian Airlines (SAS) will start having daily flights to the Faroe Islands. The central city of Tórshavn is where you will find most of the accommodations, and it’s a strategic place to base yourself in for all your adventures around the islands. (Of course it can get cheaper if you get places outside of Torshavn, but for the best picks of all, they would be the following). How to get Faroese currency? The Faroese currency is the Faroese króna (kr). It is not an independent currency, but a version of the Danish krone, hence they are equal in value. So yes, you can use your Danish notes throughout the Faroes for payment. When you leave though, make sure that you exchange any Faroese notes you may have into Danish notes (or any other foreign currency) because the Faroese notes are not acknowledged outside of Denmark. Now, I highly advice that you do NOT exchange your money at the airport since the rates there are totally not competitive. What should you rather do? Either exchange your money or US dollars at a bank or at a money exchanger; or better yet, just withdraw from an ATM. Gasadalur was the first location that I visited from the moment that I landed at the airport, and true enough, it served as such a wonderful welcome! Without question, this is a place that you MUST see in your lifetime. I am absolutely thankful to ‘Visit Faroe Islands’ for making this trip possible and for making me see more of the beauty and culture that these unspoilt group of islands hold. I surely hope to be back soon so that I can see more of its out-of-this-world vistas! What do you think of Gasadalur? Would you like to see the Faroe Islands? Why or why not? I’m planning a trip to the Faroe Islands in the near future. This article was tremendously helpful. Thank you.